Students at UNI have studied and witnessed to their faith for over 100 years (1897-present). The Catholic Student Center is the oldest UNI student organization on campus. Anna E. McGovern is credited with organizing the first group of Catholic students. The first students took part in weekly study groups and fellowship activities. What is now St. Stephen the Witness has gone through many name changes. In the early years, the student center was known as the Newman Catholic association and was affiliated with the Catholic Student's Association in order to conform with the national organization. Throughout the 1940's and until 1966, the name Newman Club was used although it was not noted as a club. In 1966, the student center took the name St. Stephen the Witness Catholic Student Center. Early students did not have an on-campus student center. These students walked from campus in groups to Mass as St. Patrick's Parish in downtown Cedar Falls. In 1909, a car was chartered for students to go to church on Wednesday mornings at 5:40. The Student center gained a presence on campus when it took over a two-story house on the Southeast corner of College and 23rd street in 1948. This chapel seated 150 people. There was a library separated from chapel by a folding door which held an additional 20 people. 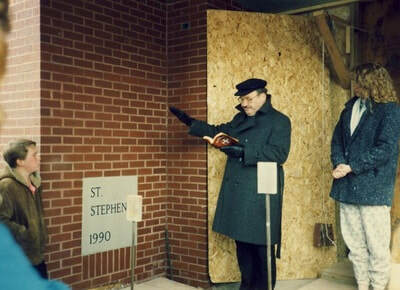 The groundbreaking and the laying of the cornerstone at the current location took place in 1990. The dedication and first Mass took place in 1991. 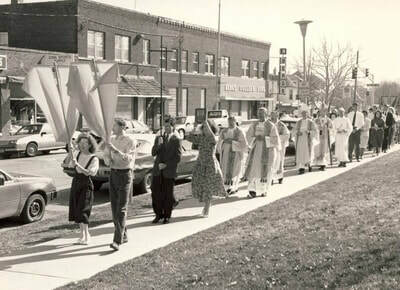 The dedication began at the old location with a procession to the new location followed by Mass. The current chapel holds 450 people. Our tabernacle is off to the side of the chapel for a few reasons. You can see onto the campus as you look at the tabernacle from in the chapel, to serve as a reminder that wherever you go, Christ goes with you. Throughout the years, faculty, alumni, benefactors, parents, Knights of Columbus chapters, St. Patrick's Parish in Cedar Falls, the Archdiocese of Dubuque and many friends have contributed to the ongoing work of the Catholic Student Center in many selfless ways. To our founders and many benefactors, we offer our heartfelt thanks and prayers.